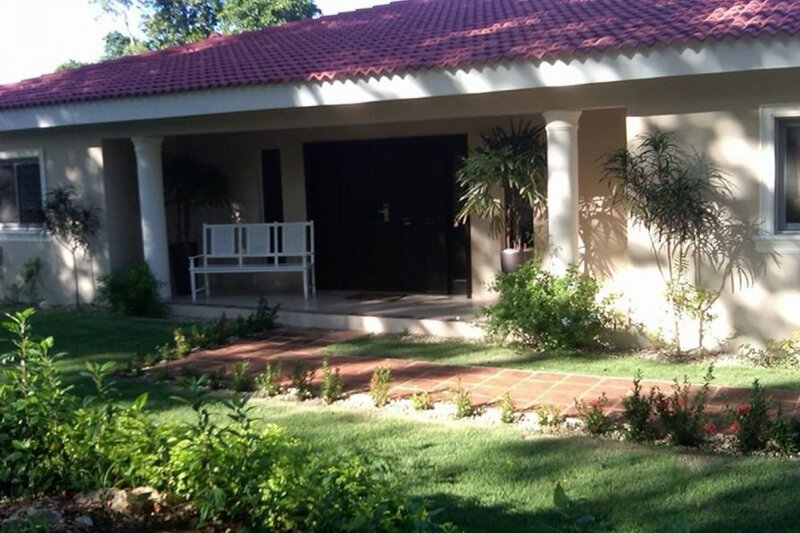 This 5 bedroom villa is located in Sosua and sleeps 10 people. It has WiFi, parking nearby and air conditioning. The large curved couch frames the opposite side of the room, while comfortable accessory seats are situated around the coffee tables making it the ideal place to relax and enjoy time with your family or with any friends or relatives you might decide to invite.Just behind the couch you will then find a large glass sliding doorway that beckons you outside and permits ample lighting to bring life into the room. On the other side of the room, however, is another doorway that leads you into the stunning kitchen a place you will actually want to spend time in when you see what this vacation villa has to (URL HIDDEN) white countertops accent the dark wooden cabinets perfectly while the stainless steel appliances throughout the kitchen show off the finer touches. The island in the middle is complete with an overhang allowing three bar stools to be comfortably sat.